You will know the different kinds of index indices and how to use them for searching. SeqAn provides a common interface, called the Virtual String Tree Iterator (VSTree Iterator), which lets you traverse the IndexSa, IndexEsa, IndexWotd and IndexDfi as a suffix tree (Indices definition), the IndexQGram as a suffix trie, and the FMIndex as a prefix trie. In the first part of this tutorial we will concentrate on the TopDown Iterator which is one of the two index iterator specializations (besides the BottomUp Iterator). The second part will then deal with the DFS. 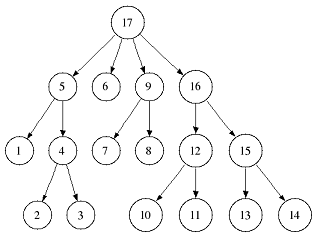 For index based pattern search or algorithms traversing only the upper parts of the suffix tree the TopDown Iterator or TopDown History Iterator is the best solution. Both provide the functions goDown and goRight to go down to the first child node or go to the next sibling. The TopDown History Iterator additionally provides goUp to go back to the parent node. The child nodes in IndexEsa indices are lexicographically sorted from first to last. For IndexWotd and IndexDfi indices this holds for all children except the first. In the next example we want to use the TopDown Iterator to efficiently search a text for exact matches of a pattern. We therefore want to use goDown which has an overload to go down an edge beginning with a specific character. The following examples show how to iterate IndexSa, IndexEsa, IndexWotd or IndexDfi, i.e. Index specializations representing suffix trees. The result of the iteration will look different on Index specializations representing tries, e.g. FMIndex or IndexQGram. Indeed, the topology of an Index changes depending on the chosen tree or trie specialization. Note that any suffix tree edge can be labeled by more than one character, whereas any trie edge is always labeled by exactly one character. First we create an index of the text "How much wood would a woodchuck chuck?" Afterwards we create the TopDown Iterator using the metafunction Iterator, which expects two arguments, the type of the container to be iterated and a specialization tag (see the VSTree Iterator hierarchy and the Iteration Tutorial for more details). The main search can then be implemented using the functions repLength and representative. Since goDown might cover more than one character (when traversing trees) it is necessary to compare parts of the pattern against the representative of the iterator. The search can now be implemented as follows. 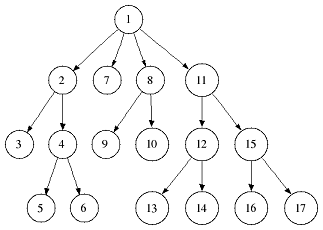 The algorithm descends the suffix tree along edges beginning with the corresponding pattern character. In each step the unseen edge characters have to be verified. If all pattern characters could successfully be compared we end in the topmost node who’s leaves point to text positions starting with the pattern. Thus, the suffixes represented by this node are the occurrences of our pattern and can be retrieved with getOccurrences. When implementing recursive algorithms such as an approximate search using backtracking, we recommend the use of the TopDownIterator without history. By passing the iterator by value, the history is stored implicitly on the call stack. Copy the code into a demo program and replace the text with a string set containing the strings "How much",``”wood would”`` and " a woodchuck chuck?". The difference is the format of the positions of the found occurrences. Here, we need a Pair to indicate the string within the StringSet and a position within the string. At each node print the text of the edges from the root to the node. You may only use the functions goDown, goRight, goUp and isRoot to navigate and representative which returns the string that represents the node the iterator points to. Use a TopDown History Iterator. Modify the program to efficiently skip nodes with representatives longer than 3. Move the whole program into a template function whose argument specifies the index type and call this function twice, once for the IndexEsa and once for the IndexWotd index. We modify the DFS traversal to skip the descent if we walk into a node whose representative is longer than 3. We then proceed to the right and up as long as the representative is longer than 3. The FMIndex supports bidirectional iteration, i.e. a pattern can be extended to the left or right in an arbitrary order. This is done by maintaining iterators on two separate indices, one on the original and one on the reversed text and keeping both iterators synchronized at all times. The interface is similar to what you learned in the previous section. All methods are extended by an additional tag specifying which iterator you want to use. Going down the original iterator using the Fwd tag extends the pattern to the left (since the FMIndex is traversed as a prefix trie). Using the Rev tag accesses the reversed text iterator and extends the pattern to the right. All methods for traversing the virtual trie are extended by the direction tag Fwd or Rev. If none is used, it will access the iterator on the original text by default (same as using the Fwd tag). The goUp method is the only method that does not specify a direction tag. goUp corresponds to an undo operation, i.e. it rolls both iterators back to their previous states. The tree traversal in assignment 2 is equal to a the tree traversal in a full depth-first search (dfs) over all suffix tree nodes beginning either in the root (preorder dfs) or in a leaf node (postorder dfs). A preorder traversal (Preorder DFS) halts in a node when visiting it for the first time whereas a postorder traversal (Postorder DFS) halts when visiting a node for the last time. The following two figures give an example in which order the tree nodes are visited. Since these traversals are frequently needed SeqAn provides special iterators which we will describe next. We want to construct the suffix tree of the string “abracadabra” and output the substrings represented by tree nodes in preorder dfs. In order to do so, we create the string “abracadabra” and an index specialized with the type of this string. The Iterator metafunction expects two arguments, the type of the container to be iterated and a specialization tag, as described earlier. In this example we chose a TopDown History Iterator whose signature in the second template argument is TopDown< ParentLinks<Preorder> >. As all DFS suffix tree iterators implement the VSTree Iterator, they can be used via goNext, atEnd, etc. If solely a postorder traversal is needed the BottomUp Iterator should be preferred as it is more memory efficient. Please note that the BottomUp Iterator is only applicable to IndexEsa indices. 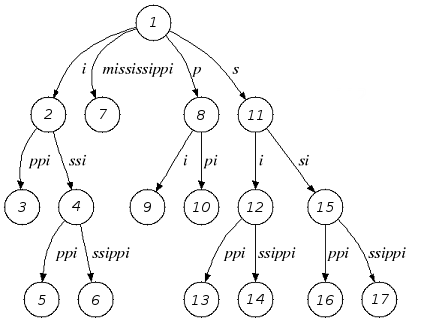 A relaxed suffix tree (see Indices) is a suffix tree after removing the $ characters and empty edges. For some bottom-up algorithms it would be better not to remove empty edges and to have a one-to-one relationship between leaves and suffices. In that cases you can use the tags PreorderEmptyEdges or PostorderEmptyEdges instead of Preorder or Postorder or EmptyEdges for the TopDown Iterator. Note that the goNext is very handy as it simplifies the tree traversal in assignment 2 greatly. Write a program that constructs an index of the StringSet “tobeornottobe”, “thebeeonthecomb”, “beingjohnmalkovich” and outputs the strings corresponding to suffix tree nodes in postorder DFS. First we have to create a StringSet of CharString (shortcut for String<char>) and append the 3 strings to it. This could also be done by using resize and then assigning the members with operator. The first template argument of the index class has to be adapted and is now a StringSet. To switch to postorder DFS we have to change the specialization tag of ParentLinks from Preorder to Postorder. Please note that the TopDownHistoryIterator always starts in the root node, which is the last postorder DFS node. Therefore, the iterator has to be set explicitly to the first DFS node via goBegin. Alternatively with a TopDownHistoryIterator you also could have used a BottomUpIterator with the same result. The BottomUp Iterator automatically starts in the first DFS node as it supports no random access. As the last assignment lets try out one of the specialized iterators, which you can find at the bottom of this page. Look there for the specialization which iterates over all maximal unique matches (MUMS). Write a program that outputs all maximal unique matches (MUMs) between "CDFGHC" and "CDEFGAHC". Again, we start to create a StringSet of CharString and append the 2 strings. After that we simply use the predefined iterator for searching MUMs, the MumsIterator. Its constructor expects the index and optionally a minimum MUM length as a second parameter. The set of all MUMs can be represented by a subset of suffix tree nodes. The iterator will halt in every node that is a MUM of the minimum length. The corresponding match is the node’s representative. In the previous subsection we have seen how to walk through a suffix tree. We now want to know what can be done with a suffix tree iterator. As all iterators are specializations of the general VSTree Iterator class, they inherit all of its functions. There are various functions to access the node the iterator points at (some we have already seen), so we concentrate on the most important ones. There is a difference between the functions isLeaf and isRightTerminal. In a relaxed suffix tree (see Indices) a leaf is always a suffix, but not vice versa, as there can be internal nodes a suffix ends in. For them isLeaf returns false and isRightTerminal returns true. Some algorithms require to store auxiliary information (e.g. weights, scores) to the nodes of a suffix tree. To attain this goal SeqAn provides so-called property maps, simple Strings of a property type. Before storing a property value, these strings must first be resized with resizeVertexMap. The property value can then be assigned or retrieved via assignProperty, getProperty, or property. It is recommended to call resizeVertexMap prior to every call of assignProperty to ensure that the property map has sufficient size. The following example iterates over all nodes in preorder dfs and recursively assigns the node depth to each node. First we create a String of int to store the node depth for each suffix tree node. The main loop iterates over all nodes in preorder DFS, i.e. parents are visited prior children. The node depth for the root node is 0 and for all other nodes it is the parent node depth increased by 1. The functions assignProperty, getProperty and property must be called with a VertexDescriptor. The vertex descriptor of the iterator node is returned by value and the descriptor of the parent node is returned by nodeUp. At the end we again iterate over all nodes and output the calculated node depth. In SeqAn there is already a function nodeDepth defined to return the node depth.